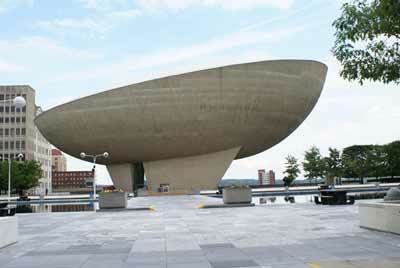 You never forget the performances you see at The Egg in Albany, New York! It's such a unique setting, with great acoustics and not a bad seat in the house, that every time you go to a show here you'll wonder why you don't come more often. The Egg is one of a kind. Beyond the obvious (that being its artistic egg shape), the performing arts venue has a number of features you won't find anywhere else. It houses 2 theaters, each more intimate than the next. The Kitty Carlisle Hart Theatre seats just under 1,000 guests, and the Lewis A. Swyer Theatre seats just under 500. Every sightline is unobstructed so even if you are in the back row (which isn't a bad seat at all) you will enjoy the performance as if you were touching the stage. That goes for whether you are seeing a music concert, comedy show, a theater performance or any of the numerous productions that stop by The Egg each month. Be prepared before you head to The Egg. First and foremost, find out how to get tickets. When you are ordering your tickets, you'll of course want to know what the seating layout of each theater looks like. And then you'll need to know where the best places to park for an Egg performance are. Here's the latest list of artists who are performing at The Egg.